More than three years ago, President Salva Kiir pledged to build schools in all of South Sudan's 10 states within 100 days of independence. That has not happened, says former "Lost Boy" Michael Kuany. So Kuany has taken things into his own hands. Around seven years ago, Kuany went back to his village in Jonglei state and asked the people there what he could do to help them. He expected them to ask for food. They asked for something else. "They said, 'Food will finish in one day or two, but if you help us with education, our children will learn and the next generation will learn from that school,'" Kuany told South Sudan in Focus by phone from Bor. So Kuany set up an NGO called Rebuild South Sudan and teamed up with a group of Americans to build a school for the people of Jalle. "We don't go in and tell them what they should do. We said, 'What do you need?' and are working with the community to give them what they need," Katie Rivers, the board president of Rebuild South Sudan said. Ground was broken in February 2012 on the spot in Jalle where the school will one day stand. Everyone chipped in to help build the school: little kids carried planks of wood, men hoisted steel beams into the air for the roof. And then fighting broke out in South Sudan last December. As the conflict spread from Juba to Jonglei state, Kuany told the people of Jalle to go somewhere safe. But many of them refused to leave their payam. "They actually didn’t want to leave because the school structure was there and that was a source of hope," Rivers explained. "They were, like, we don’t want to leave this school and Michael was on the phone with them, telling them, like, you have to leave. We can’t have a school if you’re not alive." Construction of the school was put on hold because of the fighting. Kuany said he still hopes the school will have a roof and walls by the end of this year, and that it can be put to good use by the villagers. “This school could have been operating right now but because of this crisis we actually created, it's not," he said. When construction is finished, the school will include a 5,000-book library, solar lighting so that grown-ups can use the facility in the evening and to power a ventilation system, eight classrooms that can hold 640 students, and ... a computer lab. The school was designed to be flood resistant, because Jalle sits on a flood plain, and durable, so that the building does not have to be rebuilt every year. The design has won awards in the United States and Rebuild South Sudan wants to share it with other NGOs in South Sudan and the rest of Africa, with a view to giving more villagers on the continent hope for the future. "We've talked about, not only in South Sudan but across Africa, offering this building as a prototype for other non-profits," Luke Haqq, another member of the board of Rebuild South Sudan, said. "It's a permanent structure that people can look to and have some sort of sense of home, and it also gives people in places like Jalle the sense that people care about them in other parts of the world, that their calls for help and education have been heard," he said. 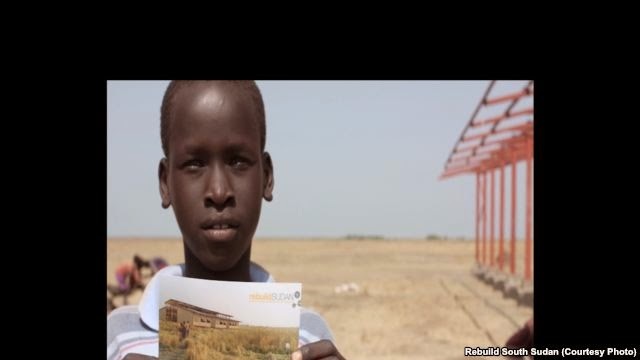 So far, only the steel skeleton of the school is standing but Kuany and the rest of Rebuild South Sudan hope the fighting will stop in South Sudan, construction of the school can resume, and the building will be able to open its doors early next year.